This collectible card game based on the popular Showtime television series allows players to collect cards representing literary characters like Dr. Frankenstein and his monster, among others. Midverse Studios and EverDead Studios have announced the release of Penny Dreadful: Demimonde on mobile devices. The collectible card game is based on the Showtime television series Penny Dreadful, and sees players collecting cards representing literary characters like Dr. Frankenstein and his monster, Dorian Gray, Mina Harker and more. When players begin, they’re asked to choose one of eight character cards as their avatar. These cards represent characters from the show, including Vanessa Ives, Ethan Chandler and Dorian Gray, as examples. Once players make their selection, they’re given a set of starter cards which can be taken into battle against other users. Players can also complete quests to earn more cards at various locations around Victorian London. Each of these locations represents a mini-game, like match-three or memory games, or even card battles against the computer. In match-three games, players create matches of three or more like symbols to damage their opponents. Each card contains a symbol matching one of the symbols on the board, with the type of symbol players use in each match, and whether they create a match by swapping symbols traditionally (horizontally or vertically) or diagonally, determining whether they damage the enemy on their turn, whether both they and the enemy attack each other on the turn, or whether only the enemy attacks them on the turn. Players can heal their character by making matches with the symbol on their character’s card. Memory games, meanwhile, challenge players to make matches with tarot cards before running out of hearts. These hearts are spent when players make an incorrect match. When players win a mini-game, they receive a new card for their deck. When players take their cards into turn-based battles, they’re challenged to defeat the enemy’s avatar card to win the game. Before players can attack the avatar card, they must defeat any defender cards on the table. Each player begins with two cards automatically in play, with a new card laid to the table on each turn. If these cards are non-character cards (like health boosts or instant attack cards, as examples), they can be played before attacking the enemy. Each turn ends when players drag one of their cards (either a defender card or their avatar card) onto an enemy defender card (or the enemy’s avatar card) to attack it. As players collect cards, they can add a limited number of each kind (character card, ability card and artifact card) to their deck. If players collect duplicate cards, these can be fused to form stronger cards. Gamers are encouraged to collect specific cards to finish in-game collections, which reward them with additional cards. However, some cards can be stolen by other players via battles, unless they’re locked with one-time use locks. Gamers can receive locks while playing, or can purchase locks as part of card bundles in the game’s store. These card bundles are available to purchase with free or premium currency, and may include not only cards and locks, but also power-up cards for use in the game’s mini-games. The gothic look and horror themes in Penny Dreadful are a perfect fit for a game released during the Halloween season. We have tested this game with fans of Penny Dreadful and fans of Card Battle games, and so far players have been thrilled. The graphics, user experience, and gameplay allow the player to feel they are entering the dark and mysterious world of the Demimonde, a half world between reality and the supernatural introduced in the series. 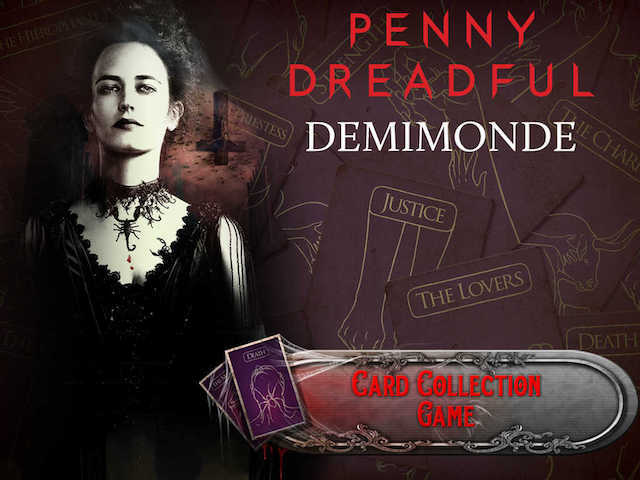 Penny Dreadful: Demimonde is available to download for free on the iTunes App Store and Google Play.